Leisure Hubs: Vans For Sale! After a little tweaking and a couple more shows under our belt, both our Toffee Brown T5 and Black T5 are for sale once again. With the recent good weather and the beautiful days we spent at this year’s Camper Jam, we’re certainly in the mood for campvanning, as we’re sure you are, and what better way to do it then in one of our Leisure Hubs campers. With our recent developments purely in the furniture department of the business, it’s finally time to let our beloved campervans go to make way for our latest venture, as we already have a portfolio packed with exclusive furniture designs. It’s no secret that purchasing a ready converted campervan can be expensive, but in the interest of moving forward with our furniture designs, we’re offering our two show vans each at a knockdown price. Both being fresh from Camper Jam means that they’re in great shape as we’ve made every effort to make sure they’re in top condition for the public as well as for resale. Our Toffee Brown LWB T30 140 is the ultimate in comfort and style, combining an exclusive interior set up which differs greatly from the standard “out of the box” furniture arrangements you get with most converters. Cleverly designed to make full use of the living space, our Toffee Brown van is complete with a side facing electric bed with the kitchen unit and storage located at the rear, providing a look which is not only exclusive but also practical and functional. With the kitchen unit and storage all located at the rear, the camper’s appliances are confined to one area, giving you more space to relax and segregate yourself from the kitchen area; perfect when camping with friends and family as to not get under each others feet. As well as being aesthetically pleasing with its two tone quilted leather interior and stunning Tigerwood veneer, the van is complete with a 39litre fridge, a full length wardrobe, storage in the rear with tambour doors, a side facing electric bed, vanity unit, pop up plugs and USB ports and a concealed coffee maker which drops down mechanically by the flick of a switch. 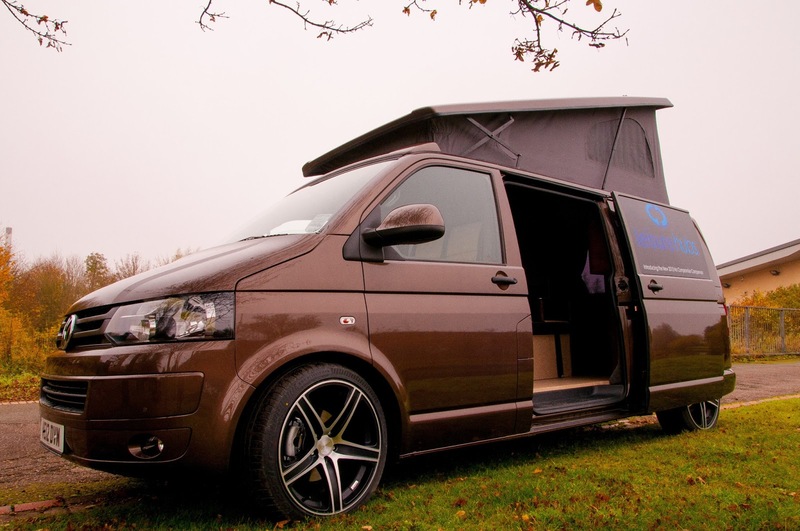 Providing a stunning combination of functional features and truly unique styling, the Toffee Brown T5 is in a league of its own and is guaranteed to provide any campervan enthusiast years of enjoyment. Priced at £38k and with just 1300 miles on the clock, the van has only been used to drive to and from shows; so the lucky buyer will be getting a virtually brand new van, full converted with some of the best features on the market at a bargain price. Moreover, we’re selling our Deep Pearl Black T5 Transporter with our exclusive heated rainforest shower built into the tailgate, an innovation in itself and a steal for 35k with just 3800 miles on the clock. First let’s concentrate on the vans most popular feature, the heated shower. Our black van has seen several shows throughout the UK and our heated rainforest shower always steals the show; people just cannot believe how we managed to pack a full functioning heated shower into the tailgate. With its stylish fixed head and easy to use design, the shower supplies a multitude of practicality, whether staying fresh while taking a long trip in the UK or Europe, using it to clean mucky dogs after a walk across the countryside or to clean surfboards or sports equipment, the shower is a simple, compact solution. Of course, this van isn’t just about the shower, it also has a living area which is packed with features including a pop up TV which is recessed into the Corian work surface and is revealed via an electric mechanism and can then be swivelled to face the seating area (which is also a comfy rock and roll bed). As well as being able to relax in front of the TV, the interior also offers a fully functioning kitchen including a hob and sink combi, 39litre drawer fridge and generous storage for all your essentials; making the campervan as convenient and comfortable as possible with enough features to mirror the functionality of a modern home kitchen. Both our campervans are the highest quality designs, and these two show vans have lead us to several conversion opportunities for various clients thanks to their show stealing presence at campervan shows within the UK. Having served us proud its now time to let another keen camper to enjoy each and every benefit of not just these great vans but also the campervan lifestyle which goes with them. Welcome to the Leisure Hubs blog! Subscribe to us for the latest in campervan lifestyle, kitchen pod design and conversion chic. VW Transporter LWB T5 4Motion…Sold!